This material is a short version of the author’s article in the issues 3, 4 and 5 of the Rybolov-Elite Magazine (Moscow, Russia) for 2011. Fuxia flowers Now we will talk on the fish we will be catching. 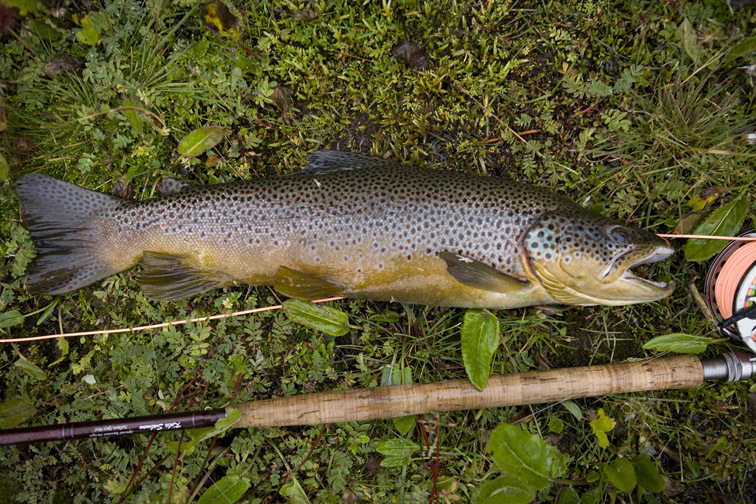 Out of existing trout species only two were stocked in Patagonia — brown trout and rainbow trout. Other interesting species (such as cutthroat trout) were not considered by the people who was deciding which fish to be moved to new continent. In the north of Patagonia rainbow trout is more numerous, and brown trout not as plentiful. . Big trout could be found also in little lakes and ponds Visa versa, in the cold South and especially at the Tierra del Fuego (TDF) Island brown trout is more numerous than rainbow. Same as in the North, the rainbow trout is here found mostly in the big lakes. In the little lakes and ponds with colored water, and in the rivers with no big lakes in a drainage the brown trout is much more numerous. 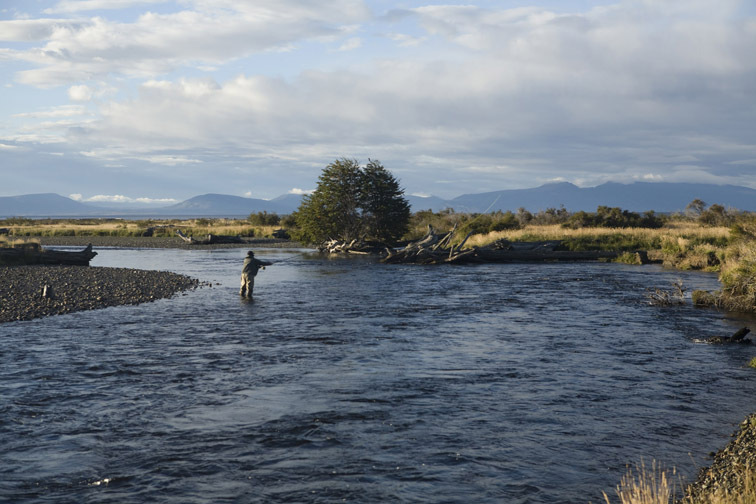 Fishing for the sea-run trout near the sea Brown trout has wide ecological adaptations and can easily form an anadromous stocks — sea trout, which is found in many streams of Southern Patagonia. In most of them this fish is not big (up to 2-3 kg, but in some of them much bigger fish are caught. So, in the Rio Grande the average weight id sea trout is 3.2 kg, and in the Rio Gallegas — 2.8 kg. Big trout is also caught in the Azopardo River, which is outlet of the huge Lago Fagnano at the TDF. The record fish from the Rio Grande was about 19 kg! Sea-run trout from the Rio Grande was caught with a little wet fly (Red Tag) In the murky, milky Santa Cruz River the rainbow trout has formed an anadromous stock — true steelhead about 6-7 kg average. `Silver sea-run rainbow trout is present in some other streams of the region, but its size is much smaller, and the numbers — less than of the sea-run brown trout. 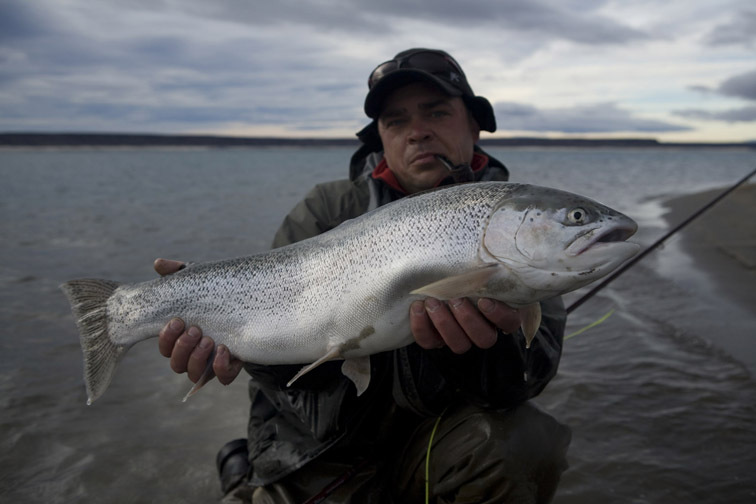 Sea trout is more often caught with tiny flies Sea-run Atlantic salmon did not do well in the rivers of Patagonia, but its lake-resident form had formed reproducing stocks is some deep, clear lakes. 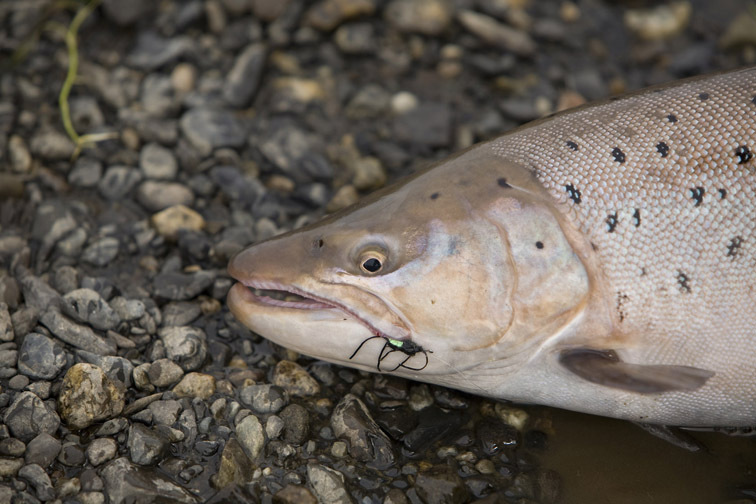 Pacific salmon (Chinook and coho) which were stocked into some streams the Chilean Pacific coast, are now conducting true expansion into Patagonia, including some drainages of the Atlantic coast which now host the stocks of Chinook. 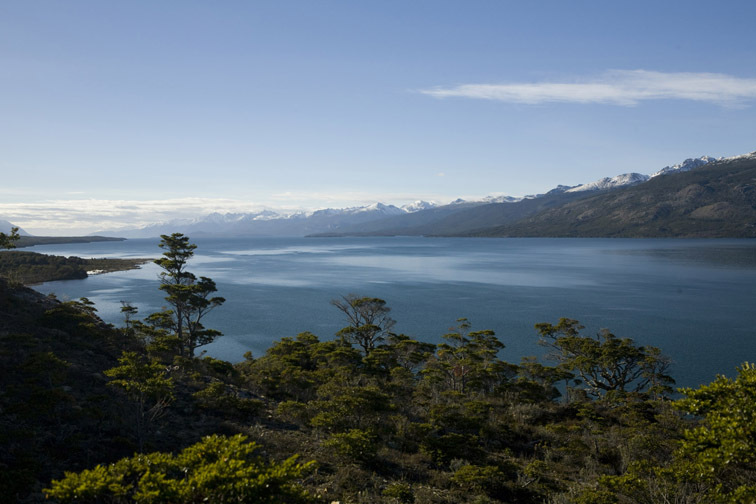 Lago Fagnano is 100 km long and 500 m deep Two charr species now found in Patagonia are of North-American origin. Brook trout Salvelinus fontinalis is well adapted to cold water. 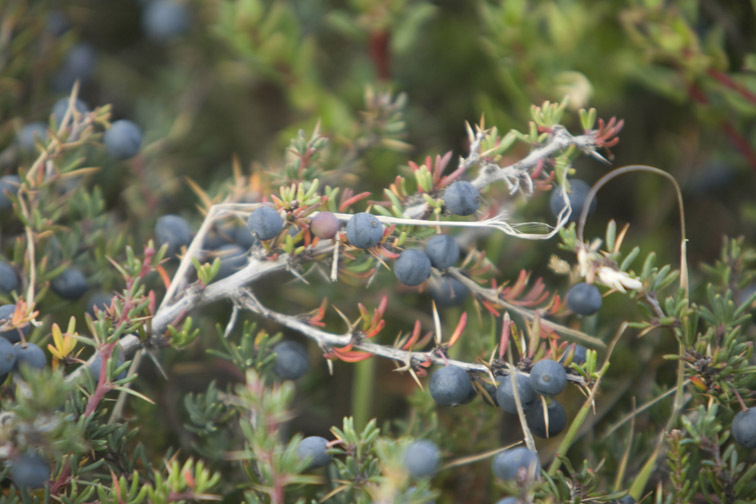 In the northern Patagonia it is feeling well only in some high-altitude lakes and rivers, but in the south it is common at the sea level as well. There are rivers, populated with brook trout only — brown and rainbow trouts are absent here. . Good size brook trout from the Rio Gallegas Chico American lake charr bears a wrong name of lake trout (Salvelinus namaycush). This fish was stocked into many big lakes, but only in some of them the stocks are self-reproducing. This is a deep-water fish which is not easy to catch with a fly. Trophy rainbow trout from the Lago Strobel (Jurassic Lake) The native freshwater fish fauna of Patagonia never was diverse; after stocking of big, predatory trouts and charrs it is seriously depleted. 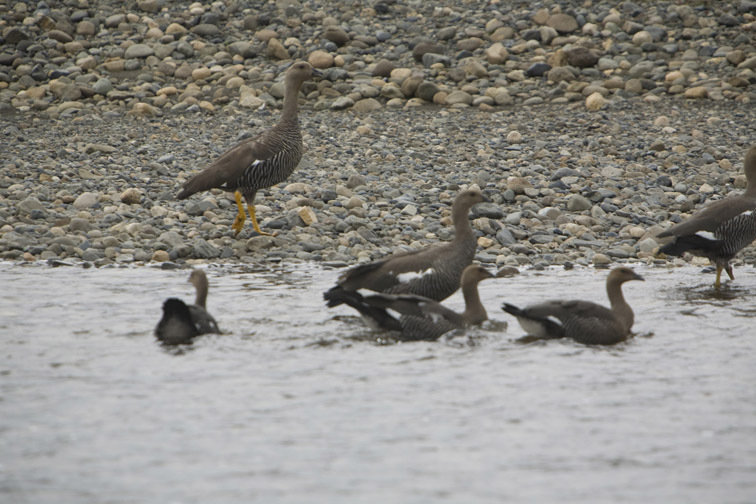 Non-native species are now dominating, and the «locals» are caught in most waters only as an exception. The only species I had was «trucha creollo» which looks like a tiny walleye. The Spanish name of this fish is róbalo patagónico; in English it is «rock cod». This coastal fish is caught in the bays and estuaries in the Southern Patagonia in both oceans. It is not a rare fish which is considered an easy catch with a fly. 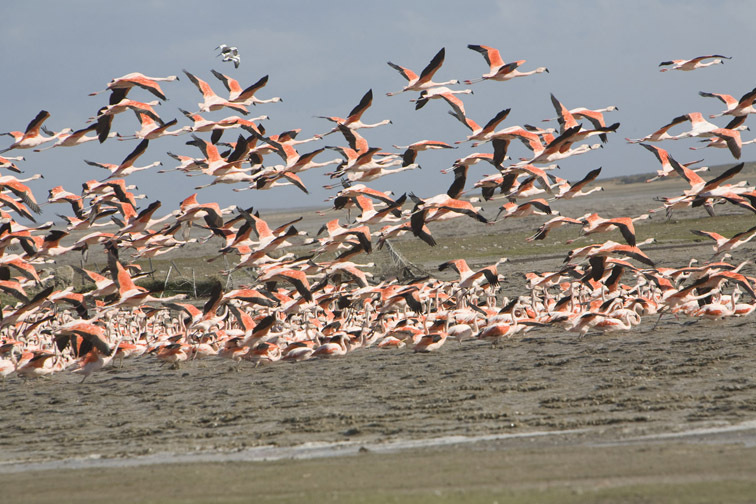 The fishing tactic is to look for it during the coming tide, when robalo is entering river mouthes for feeding. Robalo (image of Cristian Rodrigues) Diverse Patagonian conditions require a whole set of fly tackle. Light rods are necessary on calm days, especially at the lakes. At the medium size streams most of the time I was using 7 weight switch rod which allows casting into the wind. At the big lakes and rivers where it is necessary to cast far the most handy tackle was a 2-handed rod. Most often I was using a clear intermediate leader and streamers. 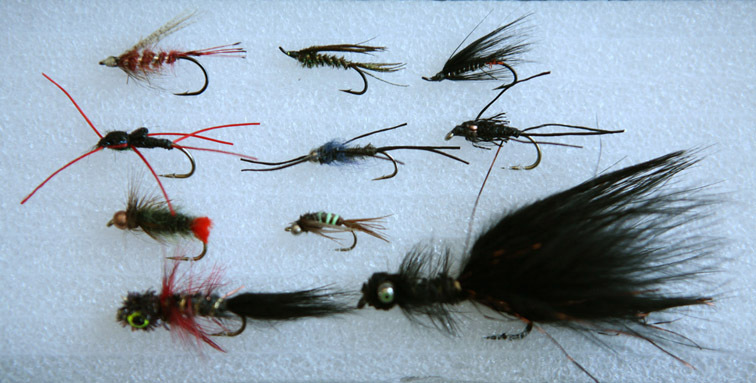 The flies most necessary for catching trout and sea trout in Patagonia The flies most often used in Patagonia are dark Wooly Buggers of the sizes 8, 6 & 4. For a long trip it is necessary to carry a «set for tying black Wooly Buggers». Local fish also love the green-black peacock feathers, so the streamers out of this material should be present in your box. Big resident brown trout only rarely bite little flies; it is easier to catch it with bigger meal. On the contrary, sea-run trout most often bite tiny flies on #10, 12 and even 14 hooks. This requires especial attention in choosing the brand of hooks to use. Probably, in many cases the best choice for trophy trout will be #12 and 14 Atlantic salmon double hooks. Rainbow trout in clear lakes is also most often biting tiny dark flies. Besides the streamers, sea trout was biting different dark nymphs. I was using these nymphs on short # 6 and 8 single hooks, so their bodies will have the same size as the bodies of regular nymphs tied at #12 hooks. The red or black rubber legs improve the action of a nymph and often attracts the trout. , Patagonian trout is opportunistic; in most cases there is no need in exact imitation of its food organisms. So, the most visible flies are often the best. .
My general fishing experience after the 6 week trip to Patagonia is that here there is no easy fishing when you could simply drive to the water edge, cast and catch good fish. In most cases it was necessary to hike a lot, and the fishing itself in many cases was rather technical and demanding. You have also keeping in mind the strong and almost constant winds. 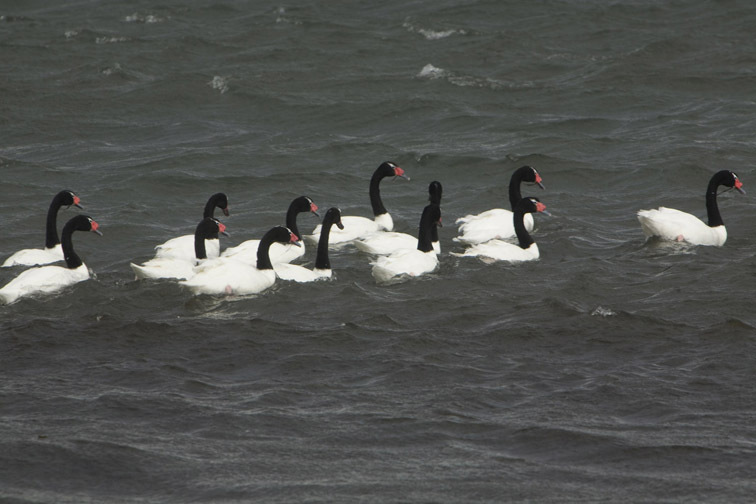 It is necessary to keep in mind that the majority of the waters in both Chile and Argentina are situated on private lands. The local fishermen are concentrated in the areas with public access — near the villages, roads, and bridges. Flyfishing is here more popular comparing with, for instance, Russia, but still the majority of the local fishermen use spin-tackle; lots of them do not release the caught fish. This make the fishing pressure in accessible areas rather strong. If you hike for some kilometers, the situation improves a lot — many local fishermen do not like to hike far. The feeding habits of the Patagonian trout make it easier quarry comparing with the fish living in Europe or North America. The local trout (especially the river-resident brown trout) is not very selective and rather opportunistic. This fish resembles me the rainbow trout in Kamchatka, lenok, or omnivorous big grayling from the northern rivers. This is why the best flies for the resident fish are big and bushy Wooly Buggers. On big rivers and especially where one target sea trout it is necessary to be a good caster and know how to present the wet fly properly. 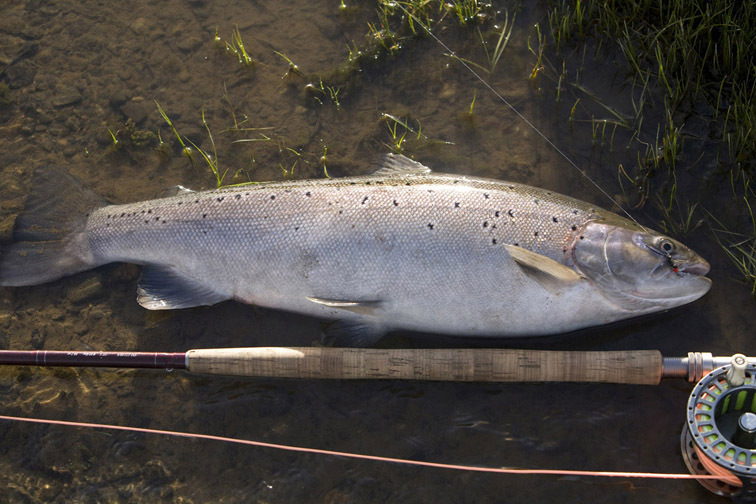 If you already have experience with Atlantic salmon or steelhead, you already know what to do. I want to make such a conclusion: after a trip to new destination a fisherman is coming back a new person. He is now become rich not only on new impressions, but also on new fishing technics, non-standard approaches to the fish. 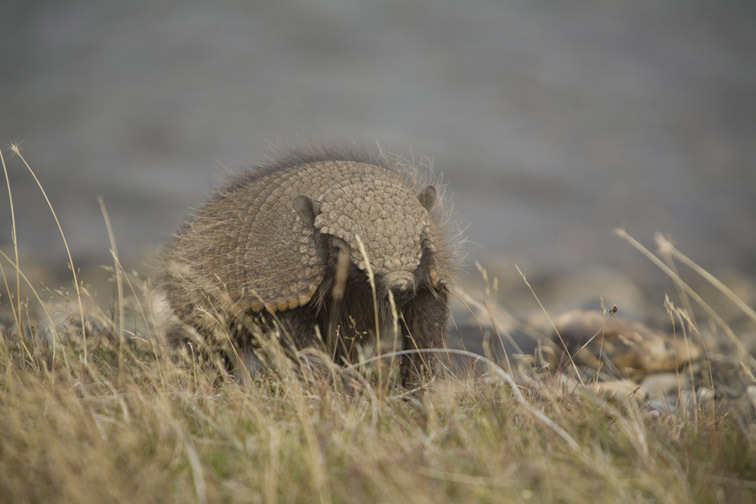 If you have a chance to visit the Patagonia, you should use it. One of the possibilities is to come to a comfortable lodge in the Tierra del Fuego Island with access to variety of different waters with resident and sea-run trout. Interested?